PuTTY is a free Telnet/SSH client that allows you to securely connect to a remote computer over a network or the Internet. Once connected, you can run commands on the remote computer as if you were physically logged into it. By default, PuTTY is bundled in Ch in Windows. Click Start->All Programs->SoftIntegration Ch ...->Utilities->putty on the Desktop to bring up the "PuTTY Configuration" window. You can also copy putty to the Desktop for easy use. Now that PuTTY is configured, you can connect to the EME machine by double clicking on the word 'eme' under "Saved Sessions". Alternatively, you can single click on the word 'eme' and then click the "Open" button. 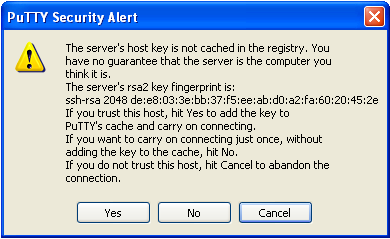 A security alert screen, as shown below, may be given. If it does, just click on "Yes". If it works, a window will pop up giving you a prompt. Enter your username and password. The system may ask you to provide a terminal type. If it does, just hit the "Enter" key to select the default terminal type. You are now logged into the EME machine.